Harley Warren is gone, but Randolph Carter can't tell you what happened no matter how many times you ask, as this short story by a pillar of the horror genre gets turned into a comic by Panel Patter's own Guy Thomas in the first of a series focusing on the flawed writer's works. Halloween may be over, but I read horror comics all year long, and I was happy to have Guy ask me if I'd take a look at this one. Thomas recently started This City Press, a micro-publisher that's currently mostly his own books, but will be expanding in the near future. One of the line's projects will be a series of mini-comics adapting Lovecraft, featuring new creators being given a space to explore their craft. It's a great idea, because it means that the artist can focus on creating the visual aspects of telling the story without trying to add their own plot as well. Why Lovecraft? Well, while the man himself was a horrible human being--as Guy notes in a hand-written introduction--his fiction has inspired countless prose and comics authors across the decades. * "It is necessary to accept that we can respect the work without respecting the person," writes Thomas--something that anyone of us who are fans of older creators--and even some newer ones--can relate to. In a second introduction, Guy also mentions another thing I tend to agree with him on--that reading Lovecraft himself can often be a tedious undertaking. 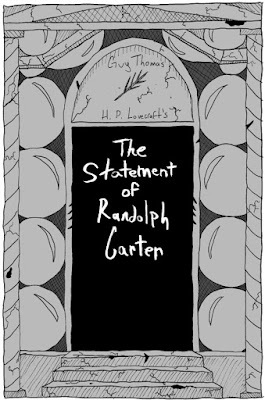 Guy wanted to see if he could bring one of his favorite stories, "The Statement of Randolph Carter," to life on the page. This is his result. For those who don't know the plot, this is one of those "I'll tell you what happened but you won't believe me" structures that work well within their time period but should almost never be done by a modern writer. Carter takes us back in time to talk about how his friend Warren becomes obsessed with a place on Earth that man was not meant to enter. The suspense and horror build to a climax, leaving poor Carter a broken man who knows that the world contains creatures far greater than ourselves--but no one will believe him. To capture that feel, Guy places Carter in a police holding cell, describing things while visions of the places and things Carter remembers serve as the backdrop. He paces it pretty well, being sure not to overload too much on walls of text. Given Lovecraft's love of words, that's no mean feat. As with most folks who work within mini-comics, Thomas's focus is on the main characters. Thus we do get a lot of pages where concealing blackness envelops the characters or a simple moon indicates place. That also allows Guy to be very nebulous about the time period this is set in, which I really liked. The upside to this approach is that when Thomas does provide a detailed background, it really pops. When we reach the cemetery and hundreds of headstones are gathered together in a claustrophobic representation of emptiness and death, complete with varying shapes and sizes, it really pops, making the reader step up and take notice. Similarly, foreboding runes and shadowy images help to set the mood when they are present. It would be great to get some more of this from Thomas in his next attempt, even if they aren't perfectly drawn. The more that an image can bring to the reader, the better, allowing them to linger and think on what they're seeing. One of the other nice things here is Thomas's desire to keep the panels varied and try different approaches. Even though this is an "indie mini" we still see things like extreme Kirby close-ups, pages that feature a splash with text rotating around the main image, tight panels, and other signs that this is truly meant to be an exploration of craft, not just an adaptation. 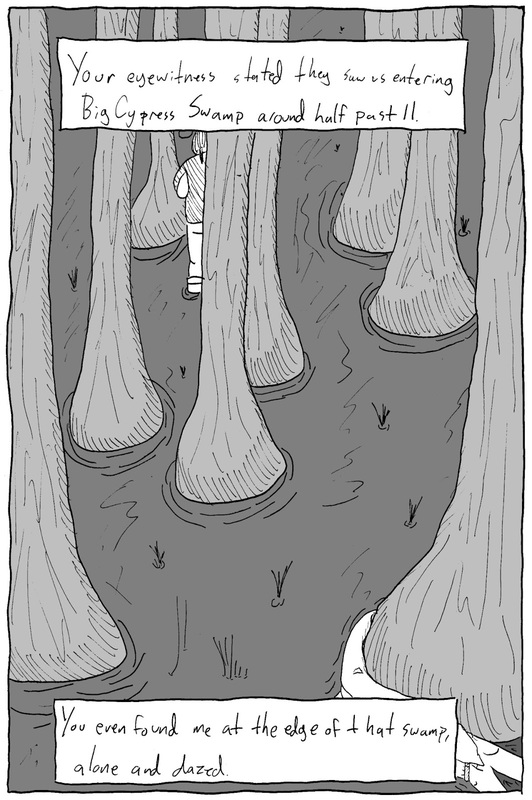 The fact that this wasn't just a series of 2-panel pages really helped, especially with pacing of the story. Similarly, while Thomas's figures and faces are still on the rough side, the fact that we can tell what Carter and Warren are thinking behind their words by the changes of their expression on their faces is a good sign that Thomas isn't content to just let his characters stand and stare are you. They're moving, living things--at least within their world--and need to act like, well, real people. That's something that will serve him well as he improves his line work. There are some things about this comic that will be a barrier for readers, however, depending on how many mini-comics you read. First and foremost is the lettering. Thomas opts to hand-letter, which is fine, but it's not straight at all--the words hop across the page--and the spacing can make reading it clearly quite difficult. It's more akin to the notes you'd write in class rather than, say, what you'd turn in during an in-class essay. The panel borders, too, can distract by their lack of an edge. That can be used as an effect, but here, I think it was just an experiment in hand-drawing the lines. It would be better to tighten them up before going to print, I think, so that they don't become a part of the story--unless Thomas wants them to. The other issue to be aware of is that this is a mini-comic from a newer creator. That means that you have to go into it understanding that the characters aren't going to be perfectly proportioned, sometimes an object--particularly the shovel--won't look quite right, and that there will be times when the artist's plan exceeds their ability to draw it. You have to judge this differently from, say, Boom! 's Mythos stories. There's a definite flatness to the art here, but that's true of many out there in the genre. If that's not for you, then I wouldn't recommend Thomas's work just yet, and you're probably not a person who's more interested in, say, SPX than San Diego Comic Con. As a first(?) experiment in adaptation, however, I think Guy did a really good job with this. Had I found it randomly at a comic show, I'd have picked it up. $3 for a 24 page mini is totally reasonable, and there's a lot to like here, even if it's a bit rough around the edges. Thomas is a creator at the start of his path, not the end, but he's already got a lot of strong fundamentals down that will help him tell stories that make me want to read them. I'll happily lose a bit of "prettiness" in exchange for a story that engages me. This one definitely engaged me, and if you're looking for a new creator and/or horror story to pick up, this would be a solid choice. 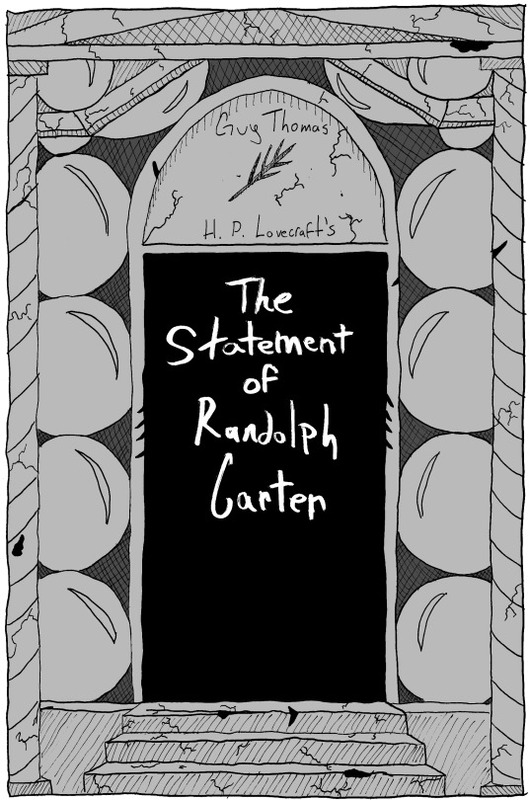 You can find The Statement of Randolph Carter at This City Press. *At Worldcon in 2015, my first, Erica and I attended a panel on Lovecraft that discussed this very thing. It's great to see the creative and fan community acknowledging that while they're really into Innsmouth, the man who drafted these stories was vile.